One of the most popular bicycle touring routes in Europe is the one around Lake Constance, the Bodensee. It is offered by many tour companies as a one week package but our group of four planned our own journey and you can too. Lake Constance has one large body of water which is about 260 km around, takeing about 4 days to ride with Germany on the north side (Eurovelo 15), a short section of Austria at the east end and Switzerland along the south shore (Swiss National Route 2/Eurovelo 6). In the middle is Konstanz with a second body of water known as the Zeller Sea also generally part of most cycling tours of the region. 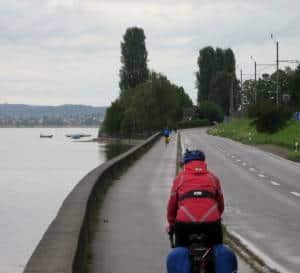 We had been following the Rhine Route so we connected with the Bodensee Cycling Route in a slight drizzle from the medieval town of Stein-am-Rhein, crossing the bridge to Switzerland and up a small incline to join the route. This section is about 50 km and is along a well signed paved bike route with good views of Lake Constance to your left although sometimes you ride next to a rail line. This section is very flat. 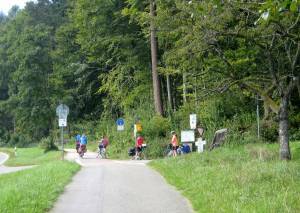 Take care when approaching Konstanz as the route meets many local bike paths. We rode to the waterfront and our hotel which had a bicycle storage area already with plenty of bicycles. Be sure to take a walk along the attractive waterfront, visit the cathedral and enjoy a drink at one of the outdoor cafes. Excellent choice of restaurants for dinner, one of my favorite towns. We followed the signed bike route through some residential area’s before reaching the lake, easy to follow as there were plenty of other cyclists, day trippers and those bicycle touring. A short ride brought us to the entrance of Mainau, island of flowers. We did not stop to visit but soon reached the base of the only significant hill on this route. You start by heading inland on a quiet road but soon reach a bike path as you continue to climb. There are a few dips before you decent on a quiet road, although I was passed by a class of school kids on bikes to the town of Bodman back on Lake Constance. The next section is a joy as you follow the flat shoreline on quiet roads, paved bicycle trails with superb lake views to the right and vineyards and apple orchards to the left. 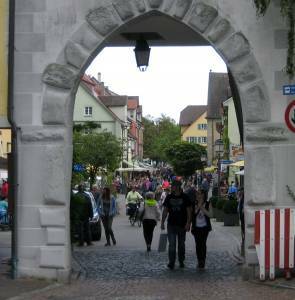 Reaching Meersburg, we entered through the gate into a medieval town crowded with shoppers. We had reservations at a hotel right in the middle of the action. We were not too happy with the the stern German owner, but he made up for for its with a lavish buffet breakfast the following morning. Many visitors headed to the waterfront cafes to watch the passing ferries and distance Alps, this coast is often referred to as the German Riviera. However ever the explorers we headed up the steep hill to visit Meersburg Castle with 43 rooms open to visitors, well worth the entrance fee. Riding along quiet bike lanes and streets the signed route is easy to follow, also as there were plenty of other cyclists also on the route. I lost the other members of my group but we happened to meet up again 20 km later, easy to do on a signed route. You pass through Friedrichshafen, home of the Zeppelin Museum. At Lindau we took a side trip on the bicycle route to the island to view the scenic harbor, enjoy some ice cream and tour the town. 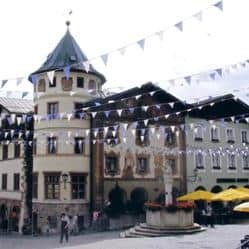 Then continuing along this 61 km section we soon reached the border of Austria and the town of Bregenz which is hemmed in between the lake and Alps. 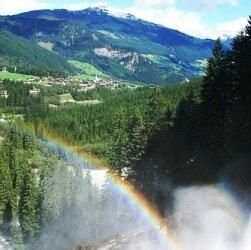 We took the cable car to the top of the Alps along with many hikers for fine views. Our ride today turned out to be 61 km mostly along the lake. However just before the town of Rorschach the route heads inland so you can cross a bridge over the Rhine River as it reaches Lake Constance from Switzerland. When we return to the lake we pass several towns, all with harbors full of sailboats. Very flat section with easy riding. We had reserved a B & B in Kesswil and enjoyed dinner in the only restaurant in a local campground, joined by others also cycling the Bodensee. 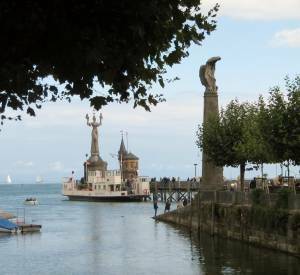 We continued along the south shore reaching Konstanz again in short order. After heading through town we headed out on the route around the smaller Zeller See. 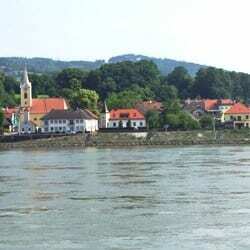 We soon reached the causeway to the island of Reichenau, a UNESCO heritage site. Very popular as we saw plenty of other cyclists, bike tour groups and bus tours all of which headed to the three interesting churches. We also circled the island and stopped at a café across from one for coffee and some pastries. Returning to the mainland we continued through Radolfzell to our hotel in the small town of Moos. Small towns often have cheaper accommodation prices and this hotel also featured a bicycle storage room. It is only a short 25 km back to Stein-am-Rhein so this section provided some hills so we had to work a little harder, but still superb lake views and an interesting medieval town at the end. 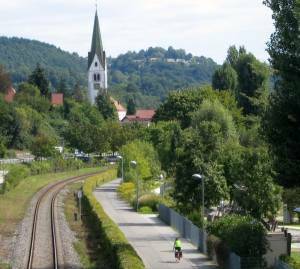 You can continue on the Rhine Route or as we did took a local cycling route to Zurich. Click here to check out other European cycling routes. Expect lots of company on this route from both day cyclists and those bicycle touring. The Lake Constance cycling route is suitable for any level of cyclist, offers great lake views, apple orchards, vineyards, castles, cable car rides up the Alps and medieval towns making for a great bicycle touring journey.